How to make Homemade French Baguettes from scratch with a crispy crust. 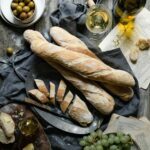 Easy baguette recipe using a bread starter Poolish. Add the flour yeast, and water together in a small to medium bowl. Gently stir together with a wooden spoon until a wet sticky dough is formed. Cover with plastic wrap and let sit at room temperature for up to 12 hrs. Sift flours into a medium bowl then hand whisk. Add in yeast and salt, then stir. In bowl of stand mixer combine entire poolish and dough ingredients. Using dough hook turn mixer onto low speed. Work dough until formed and only sticking to bottom of bowl. Dough will be tacky and slightly rough in texture. Transfer to lightly oiled bowl cover with plastic wrap. Set in warm draft free location for 30 minutes. Uncover dough grab dough with a slightly oiled hand, pull then stretch and fold the dough over itself. Cover and set for another 30 minutes. After you have done two stretch and rest periods allow the dough to rest for a final 30 minutes. Transfer dough onto a lightly floured surface. Gently deflate with hands and divide it into three equal pieces. Shape each section into a ball. Lightly oil three small bowls put a dough ball into each container, cover with plastic wrap and let sit for up to an hour. While your dough is resting prepare your Couche. see note in post above. Take one dough ball out to work with at a time. Place on a light floured surface and flatten. Fold the dough from the bottom third up and then the top down. Rotate and repeat. This folding and pressing with the heels of your hands to flatten the seems with help the dough to stretch out lengthwise. Ever so gently transfer the elongated dough to the couche and place seem side down on the flat linen. Next create a wall, by pinching the linen on both ends to protect the long side of the dough.Repeat this process with the final two pieces of dough. Allow baguettes to rest in the couche for 45-60 minutes. Preheat Oven to 450 F and place a pan on the bottom rack on bottom of oven. Take a large rectangular baking pan flip upside down and cover with a sheet of parchment paper. To transfer baguettes place a cookie sheet next to dough on the couche. Gently lift the linen and roll the baguette onto the cookie sheet. Only do one baguette at a time.Then simply let the baguette softly roll onto the prepared pan. Next score your bread with a sharp knife or baker's lame at a 45 degree angle. Cut three diagonal slashes down the length of the baguette. Fill pan in the bottom of the oven with boiling water. I also spray the walls of the oven with a little water for extra steam.